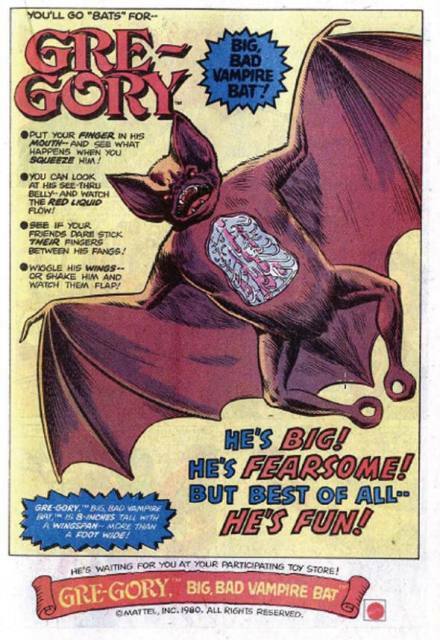 Do you remember…GRE-GORY, BIG BAD VAMPIRE BAT? 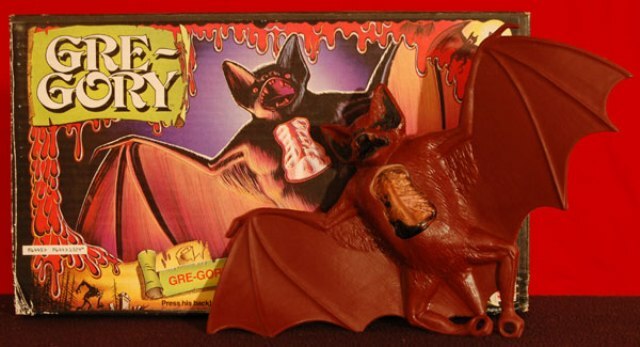 Gre-Gory, the Big Bad Vampire Bat, by Mattel, is a toy that though I never owned personally, is one I always remembered! Being a monster fan as a child meant monster toys that for the most part were few and far between. I remember when I first saw the commercials for this toy it was something I wanted immediately (though to be honest, I don’t remember why I never got one)! This toy came out in 1978 and to this day I am surprised that it never made it to my Christmas list! Though this is essentially just a rubber bat, similar to the ones you could find in many stores at Halloween time, it does feature some things that set it above the rest. Like most bat toys of the time he was made of a combination of rubber and plastic and he featured a 15 inch wingspan! The coolest feature though was the clear chest cavity that allowed you to see the blood flowing through its body, when you pushed a button on the back! Original comic book ad from 1980. The fangs of this creature were also sculpted in such a way that if you put your finger in the mouth, it would actually hold on like it was biting you! Now I am testing my memory since this came out 30+ years ago but I would’ve sworn that on the television commercial, it showed the kid with two red marks on his finger after being “bitten”, suggesting that it has some kind of liquid that could be also released from the fangs (though apparently this is not the case). The feet were sculpted with loops so that you could hang him upside down, to scare your unsuspecting mother or sister! Today this toy is highly sought after and can go for quite a bit of money. The problem though is that most being sold feature dried up “blood”, making the main attraction of this toy no longer operable. They do appear on eBay quite a bit, some still sealed in their original packaging. If you are buying it to keep it sealed then you should be all set as the box art in itself makes a great display piece! To close this piece I want to feature the review for this toy from the site “That New Toy Smell” on YouTube! This entry was posted in Vintage Toys! 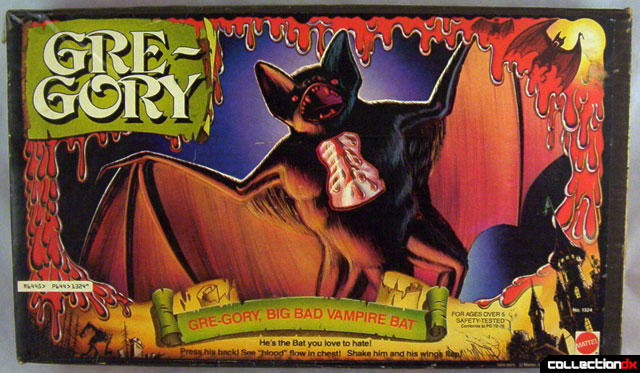 and tagged Big Bad Vampire Bat, Gre-Gory, Gregory, Mattel, Toy. Bookmark the permalink. I have this toy in my museum , Gargoyle Manor and plan on using hm in one of my next shows connected with The Devil Bat starring Bela Lugosi , I have had Gre Gory a long time now but the last time I looked his blood pump was still working. I was raised getting such toys for presents on holidays and birthdays, that is why my monster museum is so full after 45 or so years of keeping my monster toys. Thanks for the comment, Tim! Ain’t it the truth!